Necmettin Erbakan (29 October 1926 – 27 February 2011) was a Turkish politician. He was the Prime Minister of Turkey from 1996 to 1997. He was forced by the military to step down as prime minister and was later banned from politics. 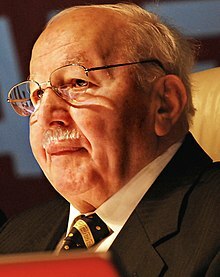 Erbakan was the founder and leader of several prominent Islamic political parties in Turkey from the 1960s to the 2010s. The famous one were the National Order Party (MNP), the National Salvation Party (MSP), the Welfare Party (RP), the Virtue Party (FP), and the Felicity Party (SP).